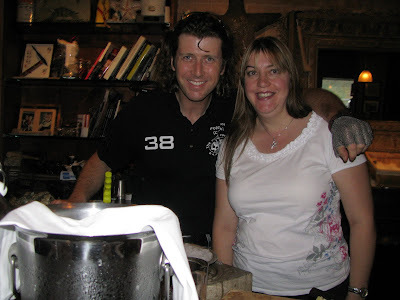 Me and World Oyster Opening Champion, Patrick McMurray! He liked my starfish necklace. Every year for the past few years Toronto holds "Summerlicious" and "Winterlicious", a period of over two weeks where many Toronto restaurants have specially priced 3-course pre-fix menus. It's every "foodies" dream, and I usually partake in a few outings. This year I visited four restaurants, three I had been before and one for the first time. 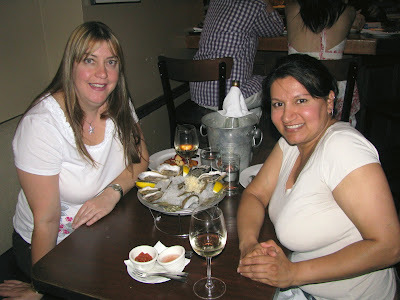 The first night of Summerlicious, myself and two girlfriends visited Pangaea. I have been a few times, as it's close to work and has become a special occasion place for me and one of my co-workers. My friends had not been before and quite enjoyed it. For my starter I had a beet and goat cheese salad, followed by speckled trout with vegetables and rhubarb tart for dessert. Pangaea uses only the best ingredients and everything was delicious, that is the reason I am a repeat customer. One of the things I have to commend Pangaea for is, not rushing us. I've found it the past that some restaurants are more concerned in a quick turn around then providing a quality experience, not Pangaea. We were there for dinner at 7pm and didn't leave til almost a full two and half hours later. It was a very enjoyable experience for us all. The following Tuesday found me at Le Trou Normand for lunch with two girlfriends. We had all been there before and usually take advantage of the special event, but also go at Christmas time as well. I'm always surprised at how un-busy this restaurant is. Sure the decor is more traditional, but the food and service are great, also, the regular menu prices are very reasonable. I started with an organic mixed green salad, followed by baked salmon with tomatoes with fine herbs in a white wine sauce and an apple tart for dessert. I'm never disappointed with the food or service here. That Friday a group of six co-workers went to Bistro 990 for lunch. Again, I've been here before, but it was a first time for most and they were really looking forward to it. I was worried when service got off to a very slow start, but with a great waitress and a tasty meal, it was all up hill from there. We started with a dozen oysters to share, then I had the panko crusted goat cheese with confit of peppers, followed by B.C. canary snapper filet almondine with israeli couscous and a white chocolate & raspberry tart for dessert. My dessert was good, but the lemon poppy-seed cheesecake they had on the menu was even better! A had a taste of my co-workers and I actually considered going back again just to get that for dessert, it was that good. We all returned to work full, happy and with plans to return again for Winterlicious. Tonight was my first trip to Starfish Oyster Bed & Grill, the last of my Summerlicious outings and the only place I took my camera. This was my favorite out of the four, as it's a casual cozy atmosphere and serves my new favorite food, oysters. I just started eating oysters on the half shell last October and am doing my best to make up for lost time. 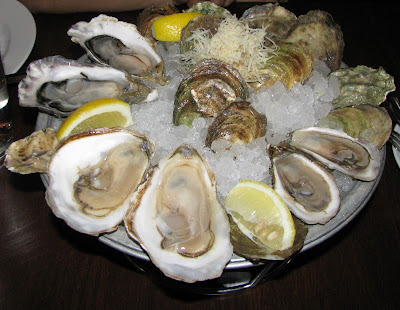 I started with, what else, oysters! Followed by PEI mussels in a white wine, shallot, fine herbs broth, served with Infamous Starfish Frites. For dessert I had the peach and raspberry cobbler. We also had a bottle of 2009 Sandbanks Riesling with our dinner and it was the perfect compliment. Before we ate our dessert we ordered another dozen oysters to share. Everything was delicious! The only negative thing I can say about the evening was our waitress brought our desserts before we received our second round of oysters after making a point of telling her that we would be ordering more oysters and would like them before dessert was brought out. Easily fixed, we pushed our desserts aside and enjoyed our oysters first. She also gave us coupons for a couple free oysters each the next time we return, so that more then made up for the mix up. He never stopped shucking the whole time we were there. I like mine with just a little lemon. Anita demonstrating the proper way to eat an oyster. Anita and I had a great time and are already planning a return visit. I definitely won't be waiting until Winterlicious to return to this establishment and next time I'm sitting at the oyster bar to watch the shucking! That's great that you take advantage of Summerlicious. We stopped doing it a couple years ago. Steelhead Trout, Israeli cous cous, spiced carrot puree, haricots vert, and apricot mostarda. Chocolate brownie with orange crème fraiche.